My One Word for 2015 is DO. One thing I am (finally) doing is decluttering the house, more specifically the room we euphemistically refer to as the "study". Our study is "that room" - the one where stuff gets put when we need to get it out of the way or out of sight. No more (hopefully). A new broom has swept through and large quantities of stuff (mainly paper) is now awaiting the recycling collection. I have been pretty ruthless. Scrapbooking, photoshop, and photography magazines have been consigned to the bin (with a few useful pages ripped out for future reference). Books and equipment have been put in a box to go on Trademe. Old school exercise books and worksheets - gone. But there has been one exception - my kids' writing books. They are staying. I can't let the writing books go because they are a glimpse into the minds of my children at a certain age. That person no longer exists. They have got older, changed, moved on to different interests. The kid who wrote endless stories about TV cartoons in year 1 has now written an alternative ending to Romeo and Juliet (one of the few pieces of writing I have been allowed to see recently and it was damned good!) Their stories make me smile and bring back memories. I am keeping them. What does this have to do with education? 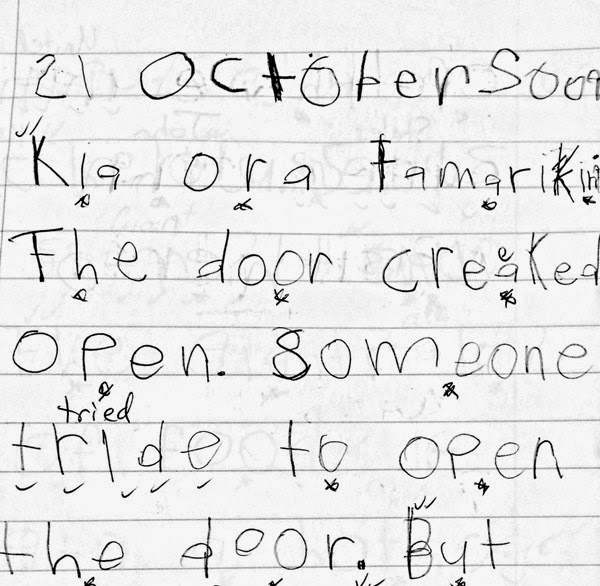 Well this experience got me wondering whether we as teachers do enough to share our students' writing with their whanau. Blogs are useful but I guess I am old-fashioned enough to like something more tangible. Last year, I made a number of class books filled with the childrens' writing which were extremely popular (they were more usually found in desks than the bookshelf). I realise now that what I should have done at the end of the year was disassemble them and remake a book for each child to take home. They could have even designed a cover for it. Next time.